Tinker Bell and Periwinkle share a fun seasonal activity to make your very own flurry of brilliantly intricate snowflakes like the ones that fall from the chilly skies of Pixie Hollow’s Winter Woods in Secret of the Wings! It’s bound to be a white Christmas with this craft, regardless of the weather forecast! Secret of the Wings is now available on 3D Blu-ray, Blu-ray, DVD and Digital Platforms and makes a magical stocking suffer! 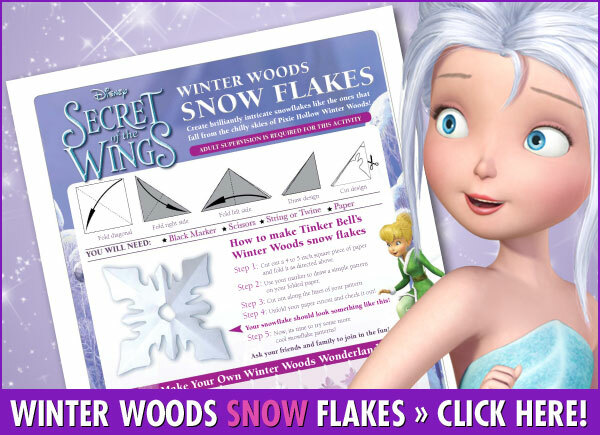 Download a Snow Flake Activity, just click on the picture. I plan on doing this with my grandchildren since I now know how to make snow flakes. It’s going to be so much fun.